Growing up, I always had good home cooking, so having good food can really impact my mood. I try to make good food to pick me up from time to time to beat the Swat stress. Sharples can be pretty monotonous and repetitive, so I decided to start experimenting with different recipes. I’ve previously worked at Chipotle Mexican Grill and my mom’s restaurant, so I have a basic understanding of the kitchen. However, I’ve found that I’m pretty lazy and don’t have a lot of time. As a result, most of my recipes are creative and easy-to-make takes on pre-existing Sharples bars. In this video I am making a Feta Grilled Cheese recipe that is one of my faves. Soak the outsides of the bread in olive oil. 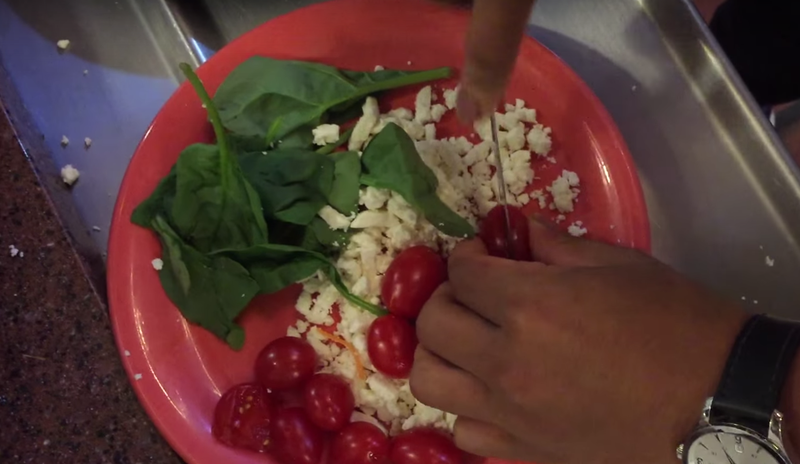 Then place the feta cheese, spinach, tomatoes, and more feta cheese on the bottom slice in that order. Put on the top slice and leave the grilled cheese in the press (at 700 degrees) until the outsides are golden brown. Add a little oregano and black pepper on top to finish. If there are any recipes that you guys would like me to try out or you want to be a chef on the show, email me at jlim1@swarthmore.edu!